A photography and sea enthusiast, Jacques Vapillon studied photography at Plymouth's College of Art & Design, after which he moved to la Trinité sur Mer in southern Brittany in 1983. This was where he first came into contact with the nautical world. He soon made a name for himself on the ocean-racing circuit, devoting himself to the coverage of many nautical events for organisers and sponsors in France and overseas (ocean races, record attempts, championships, Olympic races, round-the-world races). For more than ten years, Jacques has had a close working partnership with the multisports agency D.P.P.I., currently the market leader in the distribution of nautical images. His pictures continue to be published on a regular basis in the international press. The advent of Internet was too good an opportunity to be missed. Jacques created his own site in 1994. The rapid development in the world of communication lead him on to the development of another website. www.pixsail.com distributes copyright-free images intended for the media. 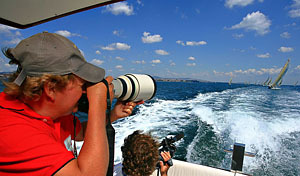 In 1994 he opens his own photogallery in La Trinité sur mer and decides ten years later to stop and get a new itinerant « production tool » : a sailingboat to realize a round mediterranean trip over several years with a new aim : adding new reports to his photolibrary on the Mediterranean coastal and maritime heritage.